Increase ROI and customer satisfaction. Properly planned and executed Customer Nurture programs boost revenue and ROI through increased retention, up-sell, cross-sell, and referral programs, to name a few, while improving the customer’s experience and their overall satisfaction with your products and services. Creating a new customer is just the beginning. Everyone celebrates when we convert prospects to new customers. But future revenue opportunities abound with customers after the first sale. Closing a new customer is just the beginning of revenue growth opportunities. 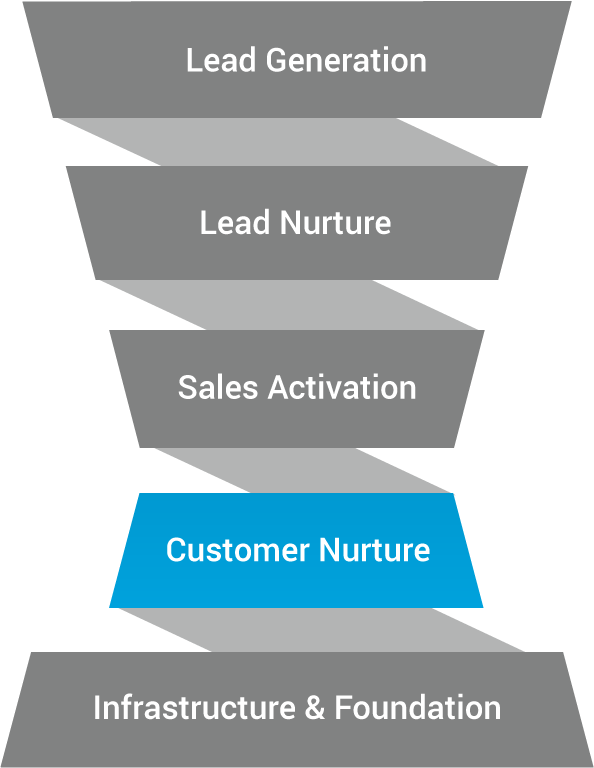 The Customer Nurture stage happens in the Post-Purchase phase of the buying process. This is a critical part of the Loyalty and Advocacy lifetime customer journey. This strategy and a set of integrated tactics allows you to transform one-time buyers into loyal supporters and repeat buyers. Focus is needed to succeed. Many of the strategies, technologies, channels, and foundational principles used earlier during the Nurture stage can be used to nature customers. However, you can’t just duplicate your content and methodology. Customer Nurture programs require special consideration and focus to be successful. The probability of selling to an existing customer is 60 to 70%. The probability of selling to a new prospect is 5 to 20%. Customer Nurture solutions from BIG IDEA. Customer Nurturing – and the revenue opportunity – is a critical part to every integrated demand generation program. Existing customers have the potential to buy more and more often, representing a remarkable source of revenue. Customer Nurture programs do not replace Customer Service. Rather, Customer Nurture programs recognize the ongoing needs of customers. You can increase customer lifetime value and substantially grow your revenue by offering products and services that continue to solve problems, satisfy needs, and add value to your relationship with your existing customers. Each BIG IDEA Customer Nurturing program starts with a complete understanding of your customers’ needs, wants, and desires. We develop a custom-tailored strategy and integrated program design that helps you enhance your relationship with your existing customer base. To create the maximum positive impact on revenue and ROI, we use predictive technology, data science, analytics, and a flexible, collaborative approach to plan, execute, then optimize your program after launch. This allows us to unlock layer after layer of revenue, making it the most effective approach possible. Customer Nurture using a strategic mix of channels and methods.